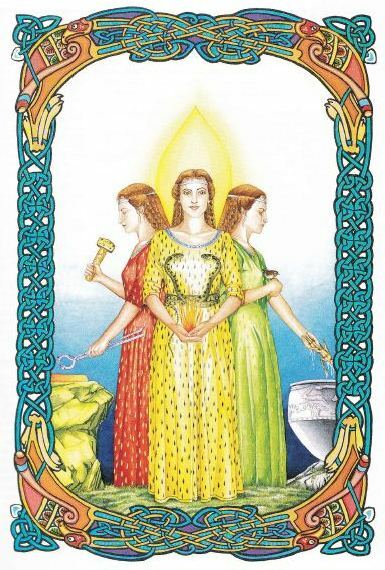 Danu is an ancient Irish triple goddess who is considered the “Great Mother” of Ireland. She is the Mother of the Irish gods and faery people, the Tuatha Dé Danann , which literally means the “People of the Goddess Danu”. Danu means knowledge, wisdom, wealth and abundance. However her name is also connected to water, and could mean ‘the flowing one’. Danu is thought to have married Bilé and was the mother of the Dagda, the chief leader of the Tuatha Dé Danann. In other myths, she is known as the daughter or lover of the Dagda. Her other children included Nuada, Dian Cécht, Ogma, Airmid, Etan, Miach, Cian/Kian, Sawan and Goibhniu. Because of the similarities in correspondences, Danu has been associated with other goddesses, including Anu, the Universal Mother, and the Morrigan, the goddess of war. Danu is also very similar to the Welsh goddess Dôn, who is the mother figure of the medieval tales in the Mabinogion. Danu was also sometimes associated with Brigid, the daughter of the Dagda. It is thought through her association with water, the River Danube was named after her. Also, there are two round-topped hills in County Kerry, Ireland, called Da Chich Anu/Anann (the Paps of Anu), thought to represent the two breasts of Danu/Anu. Danu has a strong connection to the land and water. She is a goddess of fertility, bounty, plenty, prosperity, wind, rivers, water, wells, wisdom, and inspiration. Some of Danu’s symbols include holy stones, horses, seagulls, fish, amber, gold, flowing water, air, wind, earth, moon, keys and crowns. Danu reminds us that we are capable of realizing our own dreams, empowering us to create our own destiny. Faeries are otherworldly creatures or spirits that appear in folklore. They are often thought of as human in appearance and having magical powers, however are sometimes unpredictable and dangerous. In modern cultures they are often depicted as cute tiny winged creatures, however originally faeries were depicted anywhere from tall, angelic beings to short, hideous trolls. Faeries are known by many different names and variations: Adhene, Asrai, Banshee, Bogle, Brownie, Bucca, Corrigan, Changeling, Dryad, Dwarf, Elemental, Elf, Fair Folk, Fates, Fir Darrig/Fear Deang, the Gentry, Gnome, Goblin, Good Folk, Gremlin, Gwyllion, Hobgoblin, Imp, Jinni, Kappa, Kelpie, Leprechaun, Naiad, Nature Spirit, Nymph, People of Peace, Peri, Pixie, Pooka, Puck, Redcap, Selkie, Sidhe, Sprite, Spriggan, Sylph, Seelies and Unseelies, Troll, Urisk, Undine, Wee Folk, Wichtlein and others! Common themes among the Celtic nations describe faeries as a mythical race of people who have been driven into hiding by some sort of invader. One such race is the Tuatha Dé Danann following their defeat from the Milesians (Celts), forced to live underground in the hills and mounds of the Otherworld. These alternate realms have been described as Mag Mell (the Pleasant Plain), Emain Ablach (the Fortress of Apples, the Land of Promise, the Isle of Women, Avalon), or the Tir na nÓg (the Land of Youth). Faeries are known for their mischief and malice, however some faeries were known for giving protection, healing or passing their skills to mortals. In Scottish folklore, fairies were divided into the Seelie Court, the fairies who would play harmless pranks on mortals but were generally kind hearted, and the Unseelie Court, the malicious fairies who would try to bring harm to mortals for fun. Faeries were prone to kidnapping humans, particularly babies, and leaving changelings in their place. Faeries were also known to use magic to disguise appearance, such as ‘fairy gold’, which would quickly reveal itself to be leaves, gingerbread or another worthless item after the debt had been paid. It is thought that if you travel to the world of faery, if you eat any of the faery food, you will be trapped in the otherworld forever. Also time is thought to pass by at a much quicker rate in the faery world, with tales of humans escaping the faery realm after what appears to be a few hours, finding that decades had past. Many trees, mounds and other natural features are considered property of the faeries, and any mortal who damages them would be cursed. In many parts of the British Isles, people would avoid building or disturbing known faery mounds or faery paths as to avoid such curses. Some people would leave offerings around their home to appease the faeries and prevent them from causing mischief, including milk, sweet desserts like cake or chocolate, shiny or pretty objects like glass, gemstones, or shells. Faeries are thought to dislike iron, charms of rowan and herbs, running water, bells, St John’s wort, and four leaf clovers among other things. Faeries appeare in folklore from ancient tales of medieval chivalry, to romantic Victorian literature and more modern tales. Faeries gained popularity during the Romanticism of the Victorian era, inspiring the image of beautiful, tiny, winged creatures, helping mortals they meet. 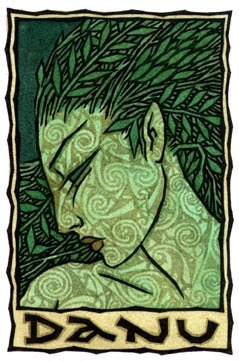 Áine (ON-ya) is an Irish Goddess of summer, love, protection, fertility, wealth and sovereignty. In her role of Moon Goddess, she guards livestock, crops, and cattle. In her role as Sun Goddess, she could take the form of ‘Lair Derg’, a red mare that no one could outrun, in order to walk among her people. Also known as a Faery Queen and Love Goddess, she has been known by other names such as the Lady of the Lake, the Goddess of the Earth and Nature, the Goddess of Luck and Magick, and Leanan Sidhe (“Sweetheart of the Sidhe”). Áine is thought to mean “brightness, glow, joy, radiance, splendour, glory, fame”. She is associated with Midsummer (Litha, Summer Solstice), however also has sacred days following Lughnasadh. She is associated with the Sun and Moon, the element Air, the direction South West, and one of the sacred herbs of Druids, Meadowsweet. Her sacred animals are the red mare, rabbit, and swan. She is associated with the Irish Province of Munster, specifically County Limerick, where the hill of Knockainy (Cnoc Áine) is found. 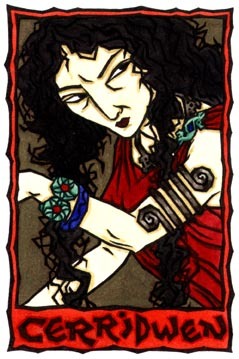 Áine is thought to be the daughter of King Eógabail/Eoghanach, a member of the Tuatha Dé Danann and the foster son of the sea god Manannan Mac Lir. However, other legends claim that she was married to Manannan Mac Lir. Other sources state that she is the daughter of the Dagda and sister to Brigid. Áine is thought to be the sister of Aillen and/or Fennen (Finnen/Fenne/Fennel). She is also thought to be the sister of Grian (Grainne), with Áine ruling over the light half of the year and Grian ruling over the dark. However Grian could also be another aspect of Áine. Áine is sometimes mistaken for the Mother Goddess Danu, who is known regionally as Anu. Áine was also known as a Love Goddess, and people would worship her in the hope that she might bestow sexuality, fertility, abundance and prosperity upon them. Through her many relationships with human men, she is thought that she gave birth to a magical Faerie-Human race, which is how she gained her name as Queen of the Faeries. One of the myths surrounding Áine describes how she sat in her birthing chair on Lughnasadh and gave birth to a sheave of grain. It is believed that by performing that act, Áine gave the gift of grain to the people of Ireland. Many stories exist regarding Áine and her mortal lovers. It is said that Gerald, Earl of Desmond, once stole Áine’s cloak while she swam in a river, and would not return it to her until she agreed to marry him. Their son was Geroid Iarla, known as The Magician. Áine made a deal with the Earl that he would never be surprised by anything her son did, however after performing a superhuman deed, the Earl was surprised, and Áine was free to return to the fairies (sidhe). In other stories, Áine is the unwilling wife of Geroid Iarla, and ends up turning him into a goose or killing him (or both). Another myth describes how Áine was raped by the King of Munster, Ailill Aulom, which led to Áine biting off his ear. By biting off his ear, Áine deemed Ailill unfit to be king due to his disfigurement. From all her aspects it is shown that Áine was not a deity to offend, if crossed she could have coined the phrase “Hell hath no fury like a woman scorned”. Invoke Áine for love, fertility, faery magick, abundance, prosperity, and the protection of women and animals. The Dagda is a powerful Irish god, also known as Eochaid Ollathair (“All Father”), Ruad Rofhessa(“Lord of Great Knowledge”), or Lord of the Heavens. His name means “good”, and is known as the god of protection, warriors, knowledge, the arts, magic, music, initiation, prophecy, weather, reincarnation, death, fire, the sun, healing, regeneration, prosperity and plenty. Sources vary in terms of his family members. In some sources, his father is Elatha and his mother is Ethniu/ Eithne. Also Danu is either seen as his mother or his daughter, probably due to his association with Brigid. The Dagda is thought to be the father of Bodb Dearg, Aed Minbhrec/Aed Cáem, Cermait Milbél, Midir, and daughters Áine, and Brigid. He was also the father or brother of Oghma. Through his affair with Bóand/ Bóann, he fathered a daughter Breg and son Óengus/Aengus /Angus Óg. He was High King of the Tuatha Dé Danann, after his predecessors Nuada and Lugh. The Tuatha Dé Danann conquered Ireland from the Fir Bolg and Fomorians, prior to the coming of the Milesians (Celts). Prior to the battle with the Fomorians, he mates with the goddess of war, the Mórrígan, onSamhain, in exchange for a plan of battle. The Dagda was described as a huge and stocky man, with superhuman strength as well as superhuman appetite. He possessed several magical objects. One of them was a great treasure of the Tuatha Dé Danann, the magic cauldron from a magical city of Murias. Known as the Cauldron of Dagda, the Cauldron of Plenty, or Undry, it was thought to be bottomless and left no man unsatisfied. Another was a giant club or hammer that could kill several men at once with its head, and bring them back to life with its handle. The Dagda also possessed a magic oak harp called Uaithne, or “the Four Angled Music”, used to change the seasons and weather, or to command the order of battle. This is also the harp that is seen on many Irish flags (and Guinness beer!) symbolizing Ireland to this day. 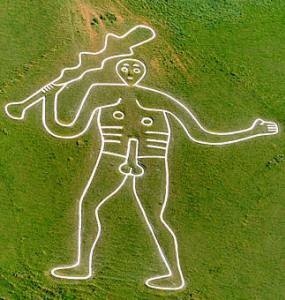 He is sometimes likened to the Gaulish god Sucellus, the striker, who is depicted with a hammer and cup. He is credited with a long reign as High King of the Tuatha Dé Danann before dying at the Brú na Bóinne, succumbing to a wound inflicted by Cethlenn/Caitlin during the Second Battle of Magh Tuiredh years prior in retribution for the death of Balor. He was replaced as King by his grandson, Delbáeth, who fathered the famous matron goddesses of Ireland, Ériu, Banba and Fodla. Cerridwen is a Welsh goddess of inspiration, wisdom, rebirth, transformation and prophecy. She is known as the keeper of the cauldron of knowledge, the mother of transformation and change, and the white lady of inspiration and death. Cerridwen holds great power and knowledge and is often described as a crone goddess, creating a triad with Blodeuwedd and Arianrhod. She often represents the darker aspect of deity and has connections to the Underworld. She was married to Tegid and lived on an island with her daughter Creirwy the fair, and Morfran/Afagddu the dark. Cerridwen is associated with a great white sow. Cerridwen is mentioned in the Mabinogion, a collection of Welsh myths. In one story, Cerridwen brews up a magical potion in her cauldron of poetic inspiration (Awen) in order to make her son Morfran/Afagddu wise and knowledgeable to make up for his ugliness. She leaves young Gwion Bach in charge of stirring it, warning him not to taste a drop. However three hot drops of potion fall onto his thumb, which he instinctively put into his mouth. Tasting the potion, he was granted the sacred knowledge meant for Cerridwen’s son. Furious, Cerridwen chases Gwion through the seasons, changing forms and shapeshifting, until finally she swallows Gwion. She becomes pregnant, and nine months later she gives birth to Taliesin (“radiant brow”). Initially thinking to kill the child, she has a change of heart, and instead throws Taliesin into the sea. He is later rescued by the Celtic prince, Elffin, and becomes a great Welsh bard. Cerridwen’s cauldron contained a potion that was brewed for a year and a day in order to reach its full potency. The cauldron is a symbol of transformation (both physical and spiritual), enlightenment, wisdom, the womb, the Mother Goddess, and rebirth. Through the Mabinogion, Cerridwen is also associated with the legend of King Arthur. Her son Taliesin became associated with the legend of Merlin through his role of bard of the court of Elffin (Arthur). Brigid is a very important Triple Goddess in Celtic mythology. Her three aspects include the Fire of Inspiration as patroness of poetry, Fire of the Hearth as patroness of healing and fertility, and Fire of the Forge as patroness of smithcraft. She is also linked to prophecy, divination, agriculture and livestock, feminine arts and crafts. She can be thought of as the Celtic equivalent of Roman Minerva and Greek Athena. The Celtic word Brig means “exalted one”, and her Gaelic name of Breo-Saighead or Breo Aigitmeans “fiery arrow” or “fiery power”. She is the daughter of the Dagda, and one of the Tuatha Dé Danann. The Morrigan, another triple goddess, is also thought to be Brigid’s mother. Brigid was the wife of Bres of the Fomorians with whom she had three sons, including the warrior Ruadán, killed in battle. Brigid is associated with the festival Imbolc/Candlemas, which is known as St Brigid’s Day to Catholics. 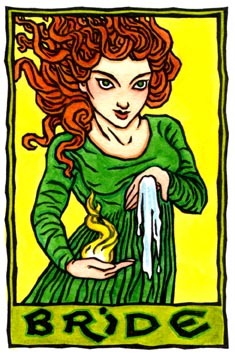 Brigid is associated with fire, including candles, heat, warmth, and sunrises. Her association with fire is so strong that a perpetual sacred flame is kept burning by the nuns at her sanctuary in Kildare, Ireland. Brigid is also connected to holy wells, including the one at Kildare. Wells were ‘dressed’ as a way to honour Brigid or ask for her help and assistance. 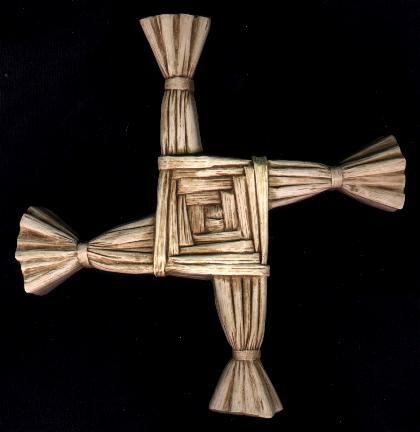 Crafts that honour her role as the protector of the hearth include Brigid corn/grain dollies and Brigid’s crosses. Other symbols tied to Brigid includes arrows, bells, thresholds and doorways. Animal correspondences include ewes, dairy cows, bees, owls, and serpents. It is thought that the love and respect for her brought unity to the Celts.